Collectible dolls are among the most beloved and recognizable collectibles of all. Whether or not you've owned or played with one, virtually everybody can immediately describe the most famous dolls, such as Barbie, Cabbage Patch Dolls, or Raggedy Ann and Andy. 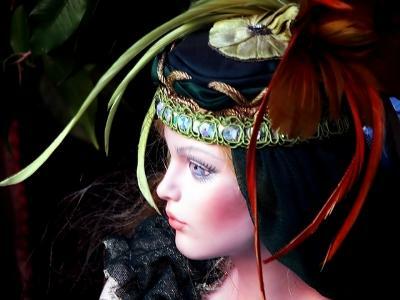 Like other collectibles, collectible dolls generally fall into one of three categories: antique, vintage, and modern. Technically speaking, antique dolls, like most other antiques, date back to prehistoric times. However, when discussing antique dolls, those produced before 1930 are considered antique. Antique dolls were usually made of wax, papier mache, wood, china, bisque, or cloth, and today that's how they're usually classified. Bisque is perhaps the best-known material. Bisque is a kind of unglazed porcelain. Its matte surface is more realistic than the shinier glazed china. These categories refer to what the doll's head was made of; the bodies were usually made of softer materials such as kid leather or cloth. Most antique dolls were made to look like adults and came with removable clothing. However, some dolls, particularly French bébé dolls and German "dolly-faced" dolls, were made to look like children. The first talking dolls, mama dolls, were invented around 1915. These dolls combined a soft body with two innovative characteristics: a voice mechanism that said "mama" when the doll was turned and leg joints that allowed the child to "walk" the doll. These realistic dolls were the first doll craze in the United States and one of the great fads of the 1920s. Another fad from these early decades of the 1900s and one of the first dolls to also appear in storybooks were the Raggedy Ann and Andy dolls. They were first created in 1915 and are amazingly still in production more than 80 years later. Antique dolls, like modern dolls, were made as children's toys and so usually show at least some wear. How much depends on what the doll was made of and, of course, how carefully it was handled. 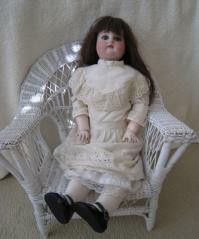 Antique dolls can be found on auction websites like eBay as well as other sites specializing in antiques. Vintage collectible dolls are those produced between 1930 and roughly 1980. This category includes the most famous collectible doll, the Barbie doll (1959), Chatty Cathy (1959), and Strawberry Shortcake (1979). These dolls are notable because they have had a lasting impact on American culture. For example, the Twilight Zone episode The Living Doll (1963) was not only based on Chatty Cathy but used the voice of the original Chatty Cathy, June Foray. Both Barbie and Strawberry Shortcake have played lead roles in many movies over the past decades, as well as being featured in children's story books, clothing designs, and toys. While most of these dolls were made of composites, vinyl, or plastic, cloth was also common, particularly for dolls designed for very young children. Madame Alexander created what is probably the first movie tie-in product, a cloth Alice doll to go with the 1933 movie Alice in Wonderland. Cabbage Patch Kids were a major fad in the 1980s, largely because of the wide range of variations that made each one was unique, capturing the spirit of the handmade originals, and because the dolls came with signed birth certificates. In October, 1985, one was even included in a NASA shuttle launch! Some consider modern collectible dolls to be only the dolls made for the collectibles market, while others include any kind of doll that becomes a collectible. Many modern dolls are continuations of vintage doll lines, such as Barbie, Madame Alexander, and Strawberry Shortcake, and some, such as Ginny and Raggedy Ann and Andy, are based on antique doll lines. These collectible dolls can be found in local venues as well as specialty stores on the Internet. Dolls, like most other collectibles, need to be stored in places that keep them from extremes of heat, humidity and temperature fluctuations, and that provide them with protection from dust but sufficient air circulation. Always use acid-free materials for packing and protection and do not let metal parts touch plastic dolls. If you have a doll you need to identify, Doll Reference has an extensive guide of dolls from the 1800s through the 1970s.